NPR Patti Neighmond interviews Director Bianca Frogner about her study showing that seeing a physical therapist can curb opioid use. CHWS Deputy Director Sue Skillman explains health care's transition from a volume-based system to a value-based system. Drs. 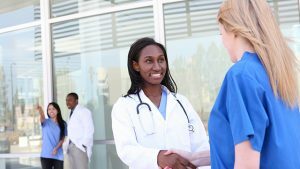 Frogner and Spetz discuss the potential impact that proposed policy changes might have on health care jobs and the challenges the United States faces in filling health care jobs regardless of modifications to, or repeal of, the current law. Read the full article here.